No credit score: Do you need a “bad credit home loan”? To get the best mortgage rates, you really do need a high credit score. But you can buy without resorting to bad credit home loans if you don’t have a score. Conforming and government-backed programs require that when applicants have no credit score, “the lender must establish an acceptable nontraditional credit profile.” That means verifying your payment history with your landlord, utilities, even regular deposits to your savings account. You must have at least three sources of payment history. The lender can research your history itself, but will more often order an NTRMCR (non-traditional mortgage credit report) from a credit service. This may cost more than a “regular” credit report. The challenge is that with no score, any negative information is likely to make you ineligible for prime financing. To get the best mortgages available, you need a credit score. But you likely don’t have to resort to a bad credit mortgage. What is a credit score and how do you get one? Your credit score, also called a FICO score, is a three-digit value ranging from 300 to 850. Three major credit bureaus, Transunion, Equifax, and Experian create your score based on your credit history. Statistics show that applicants with low scores are much more likely to default on home loans than applicants with high scores. The higher your score, the lower the interest rates offered. Low or no credit scores result in higher interest rates. Even worse, it can result in a loan rejection. Larry P. Smith, consumer protection attorney with SmithMarco, P.C., says there’s a good reason why you wouldn’t have a credit score. “It typically means that the credit bureaus do not have a report on you. Or, for some reason, they’ve suppressed all the data they have about you. It’s not a good thing,” says Smith. Katie Ross with American Consumer Credit Counseling agrees. Ross says having no credit score makes it hard for lenders to predict whether you are a good risk to repay a loan and make payments on time. “Creditors are unable to see if you are a reliable candidate to bet on. With a low or no credit score, your home loan may be denied,” adds Ross. Smith says your goal should be a credit score over 700. 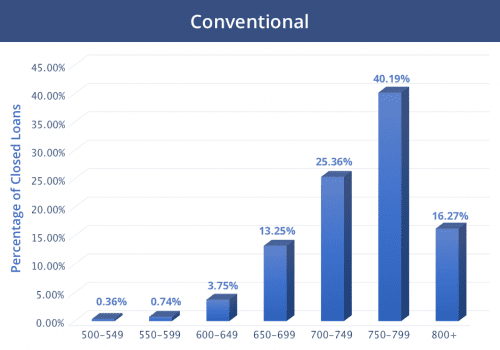 This increases your chance of getting a better loan at a lower interest rate. Most loans allow lower scores, however. 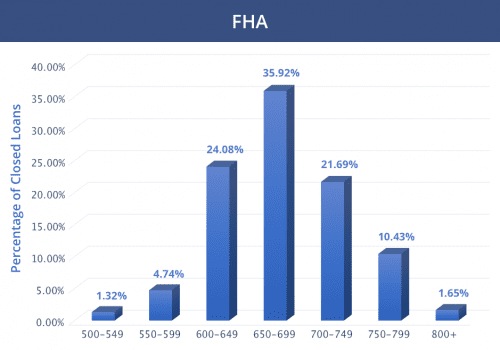 The graphics from Ellie Mae shows the distribution of approved loans in March 2018 by credit score for conventional (non-government) and FHA mortgages. Bad credit (non-prime) lenders may go as low as 500, but you’ll need a high down payment and they do cost more. It’s smart to check your credit long before you plan to apply for a loan. You can do this for free by visiting AnnualCreditReport.com. Obtain a secured credit card. “These act like normal credit cards but require you to deposit money before they can be used,” says Korash Hernandez, a consumer credit management expert with Status. Make sure the creditor reports your history to the bureaus. And beware of those with very high fees. Get a private label retail credit card. “Many retail stores offer low limit credit cards that have a low barrier to entry,” Hernandez suggests. Obtain a credit card as an authorized user on a parent’s account. “Or, consider having a reliable person co-sign with you for your own card,” says Ross. Apply for a small credit building loan from a bank. “Local institutions are often more likely to extend credit to those with little to no credit history. Acquire a small loan for an item you already have money available for in another account. This way, you’ll be sure to repay the loan in a timely manner,” Ross notes. Don’t apply for too many credit cards, loans or lines of credit in too short a time. Your credit score may decrease with each new credit inquiry. Use these cards and loans. It’s not enough to simply open the accounts. Use the credit, but don’t exceed your credit limit. Make credit payments on time. “The more recent a missed payment, the more it hurts your score,” says Smith. Pay off all or most of your balance each month. “Don’t just pay the minimum amount. Ideally, you want your balances to be about 30 percent or less than the total available credit line,” Smith notes. Check your credit report. Request a free copy at com. Review it carefully for any errors. Dispute any credit report errors you find with the three credit bureaus. Don’t expect to see or grow a credit score quickly. “Once you establish credit, it takes six to 12 months to generate a credit score,” says Michael P. Goldrick, chief lending officer for PCSB Bank. If you can’t wait that long to apply for a mortgage, try loan shopping. You may get turned down. Or you may get approved but have to pay a higher interest rate. “It’s rare. But we’ve approved loan applicants without credit scores,” says Goldrick. In these cases, a lender may review payments to utility companies, landlords and insurance providers. They may also require you to have a co-signer on the loan.